InfiSENSIS has been developed by INFITHEON Technologies, a leading manufacturer of advanced security products. The system uses infrasonic technology in order to detect the level of infrasonic waves created, by air movement, when a door or a window is opened or tampered with. The system is activated every time someone tries to intrude your space by compromising any opening, such as window, door or other entry point provided that that your doors are locked a your windows latched and any other openings are properly secured. Each time a potential intruder tries to break into your house, tests whether it is closed and locked, uses tools on openings, or applies pressure and he creates vibrations, such actions are immediately detected by infiSENSIS, thus giving you the necessary time to react. The system consists of one single device (a mini-computer with sensors), housed within a plastic panel enclosure. It requires no special installation requirements. 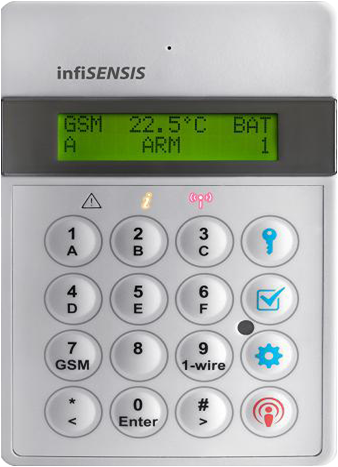 It is very easy to operate the infiSENSIS unit in your home, office or any other enclosed interior. You only need direct electrical power to the system, (power supply unit included), and simply activate it for operation. The system will inform you visually – using status LEDs, and audibly – using its built-in loud siren should the security of your home at any time be threatened. It should be noted that infiSENSIS is patented through the Hellenic Industrial Property Organisation (OBI) and a patent application has been filed in the European Patent Office (EPO).